House Speaker Nancy Pelosi said in a speech Thursday to the new Congress that Democrats want "to lower health care costs and prescription drug prices and protect people with pre-existing medical conditions." "Tens of thousands of public events were held, hundreds of thousands of people turned out, millions of calls were made, countless families, even sick little children — our little lobbyists, our little lobbyists — bravely came forward to tell their stories and they made a big difference," said Pelosi, a California Democrat. What is the Democrats' mandate? "To lower health care costs and prescription drug prices and protect people with pre-existing medical conditions," she said to applause. In their campaigns last year, Democrats promised to protect the Affordable Care Act, and the access to coverage that it guarantees for many people. Many Democrats went further, running on the promise of "Medicare-for-all." With the Senate in Republican hands and President Trump having promised to repeal the ACA, Democrats' ability to make sweeping health policy changes is limited. Instead, they'll likely rely on hearings and turn to the courts to try to influence health policy and shore up the ACA. And Rep. Frank Pallone, D-N.J., head of the Energy and Commerce Committee, announced a hearing on the impact of the ruling. He said he intends to hold lots of hearings to review the Trump administration's actions around the ACA — actions he calls "sabotage." "At a time when the Trump administration is doing all the sabotage of the ACA, I think the focus really has to be on trying to prevent the sabotage and making sure the ACA is strengthened," he said in an interview in his Capitol Hill office. That "sabotage" includes Trump's decision to stop reimbursing insurance companies for discounts they're required by law to give to their lowest-income clients, Pallone said. "I think if you do some good oversight and find out what the sabotage consists of, then you can say, 'Well this isn't allowed under the law,' " Pallone said. "And then you either take it to court or try to get legislation passed." "I don't think we should underestimate how important that is, when decisions that are being made are questioned and officials have to defend them," she said. For the past two years, the focus in Washington has been on repealing or dismantling the Affordable Care Act. That's about to change, she said. "That energy can now shift to examining what the administration is doing and putting forth other ideas and other proposals, some of which might generate bipartisan agreement," she said. Pallone acknowledged Democrats' plans are much less ambitious than the "Medicare-for-all" proposals that many of his colleagues touted during their campaigns. "I just think it's unlikely that we could ever pass it," he said. "So I don't want to prioritize that." Democrats know why voters sent them to Washington this year - health care. In their campaigns, they promised to protect the Affordable Care Act and the access to coverage that are guaranteed for many people. Many went even further, promising Medicare for everybody. Now that Democrats have control of the House, those ambitions are meeting up with reality. NPR's Alison Kodjak reports. 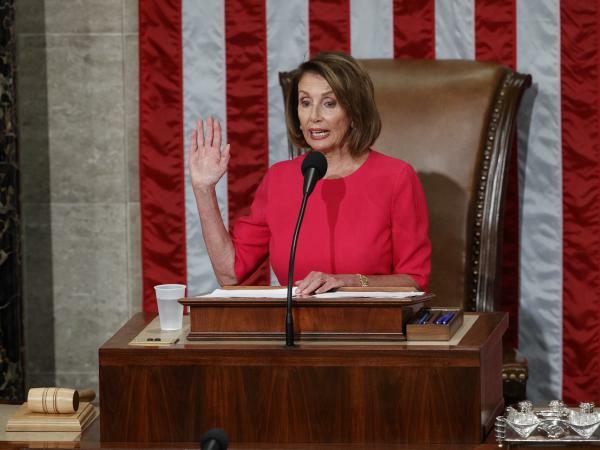 ALISON KODJAK, BYLINE: In her first speech as speaker of the House last week, Nancy Pelosi made it clear that she knows health care is why voters sent Democrats to Congress. NANCY PELOSI: In the past two years, the American people have spoken. Tens of thousands of public events were held. Hundreds of thousands of people turned out. Millions of calls were made, countless families. Even sick little children, our little lobbyists. Our little lobbyists bravely came forward to tell their stories, and they made a big difference. PELOSI: To lower health care costs and prescription drug prices and protect people with pre-existing medical conditions. KODJAK: On their first day, Democrats made their first move. They voted to allow the House to intervene in a lawsuit to protect the Affordable Care Act. The House will join several state attorneys general in appealing a Texas judge's ruling that the law is unconstitutional. But with control of just one chamber of Congress and with a hostile president, Democrats' power to influence health policy may be limited. Congressman Frank Pallone is head of the Energy and Commerce Committee, which has jurisdiction over parts of the Affordable Care Act. In an interview, he acknowledged that Democrats will likely have to settle for hearings and lawsuits because it will be hard to pass substantial legislation. FRANK PALLONE: You know, at a time when the administration is doing all this sabotage of the ACA, I mean, I think the focus really has to be on trying to prevent the sabotage and making sure the ACA is strengthened. KODJAK: According to Pallone, that sabotage includes Trump's decision to stop reimbursing insurance companies for discounts they're required by law to give to their lowest-income clients and the Department of Health and Human Services change to the guidelines that allow people to buy insurance policies that don't carry the full benefits required by the ACA. PALLONE: I think a lot of it is not even legal, right? In other words, it violates the law. KODJAK: So he's planning hearings to examine whether the changes are legal. PALLONE: I think if you do some good oversight and find out what the sabotage consists of, then you can say, well, this isn't allowed under the law. And then you either take it to court or you, you know, try to get legislation passed. CHIQUITA BROOKS-LASURE: I don't think we can underestimate how important that is when decisions that are being made are questioned and officials have to defend them. KODJAK: That's Chiquita Brooks-LaSure, a managing director at Manatt Health Strategies. She says for the last two years, the focus in Washington has been on repealing the Affordable Care Act. BROOKS-LASURE: That energy can now shift to examining what the administration is doing and putting forth other ideas and other proposals, some of which might generate bipartisan agreement. KODJAK: There may be some Republican support for shoring up the ACA. In the last Congress, Republican Senator Lamar Alexander proposed some bills to stabilize the ACA marketplaces. Pallone acknowledges Democrats' plans are much less ambitious than the Medicare-for-all proposals that many of his colleagues touted during their campaigns. PALLONE: I just think it's unlikely that we could ever pass it, so I don't want to prioritize that. KODJAK: That, he says, is the reality of a divided Congress. Alison Kodjak, NPR News, Washington. Transcript provided by NPR, Copyright NPR.